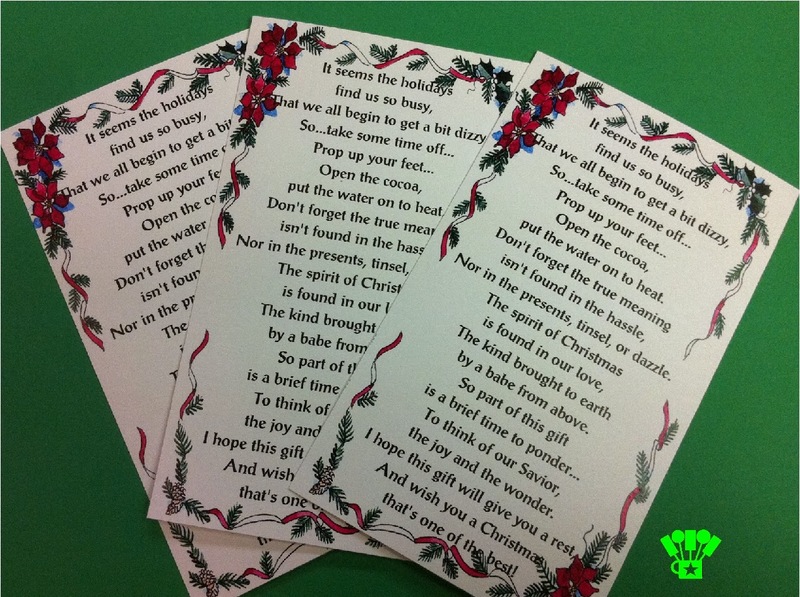 A quick and easy gift idea using hot chocolate and this religious Christmas printable poem. So easy! 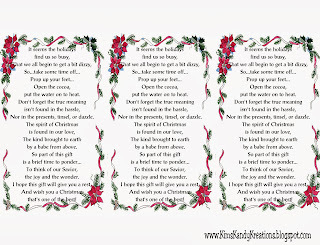 With the Christmas season upon us, it seems to be there is never enough time to make all the gifts for everyone on our lists. At least I find that happening. All too often, I'm thinking about our sweet bus driver who waits for my kids in the snow so they don't have to stand outside in yucky weather; the mailman who always has a kind word even when bringing those nasty bills, and the ladies at my local dry cleaners who know me by name and ask after my dad's health scare. 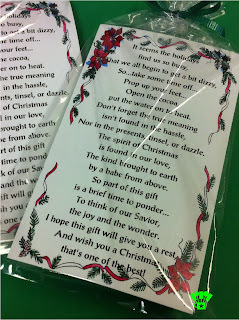 I have great intentions of making these great Christmas gifts for them, but run out of time and energy. So I'm starting before the "last minute" this year and plan to have a bunch of these Easy Christmas cocoa gifts in my purse. That way, I won't forget anyone as I'm out and about running errands and remember someone else who has made my day a little brighter. 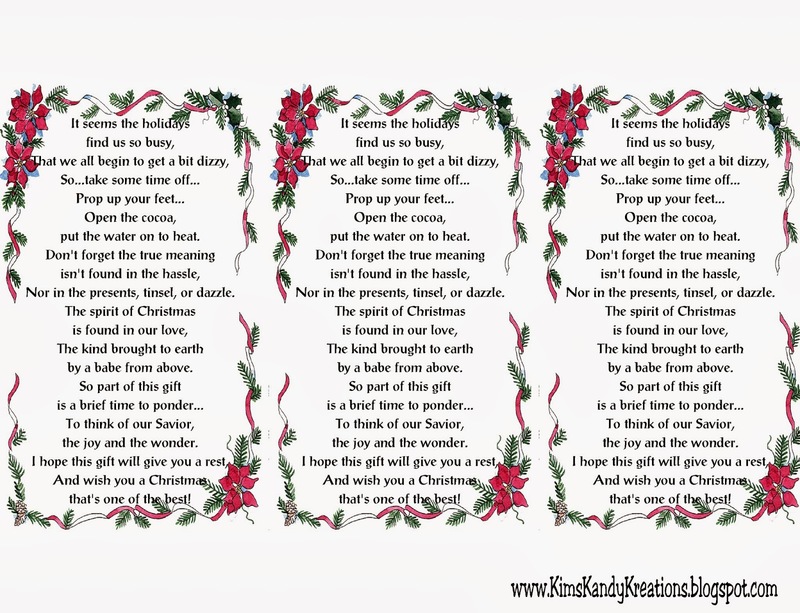 Start by printing out the Christmas Cocoa poem at the bottom of the page onto good card stock. You will need to right click on the picture and save it to your computer. Then you can print it out using your computer's print program. There are three Christmas cocoas to a page. I wish I could take credit for this beautiful program, but I don't know who wrote it as I've had it for MANY years. So if anyone knows, please let me know so I can give proper credit. I used some good Starbucks® Hot Cocoa Mix in peppermint and toasted marshmallow flavors. I found this brand at my local grocery store, so you can probably pick it up anywhere or even at Amazon. 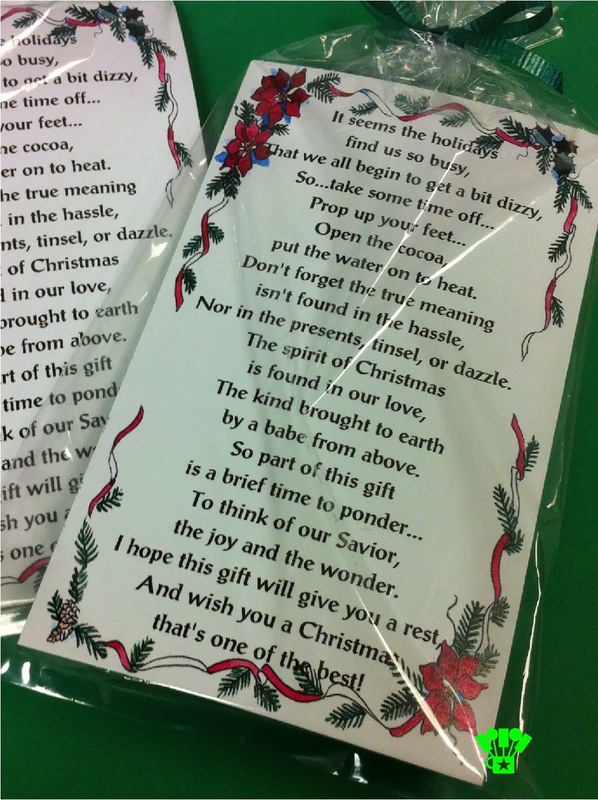 Simply add the hot chocolate to a 4" x 10" Candy Treat Bags and then the Christmas cocoa poem. 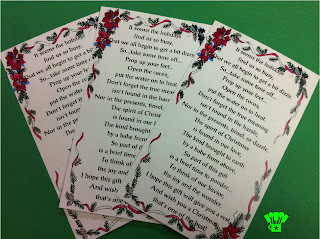 I tied mine with a bow using Emerald Green Curling Ribbon to accent the green in the poinsettia leaves on the poem. Now you have some easy Christmas cocoa gifts for everyone on your Christmas list too! Very cute gift idea, thanks for the printable. Hopping over from Ducks 'n a Row party. What a beautiful little card to go with a favorite gift! I love having sweet little extra gifts on hand and I really love this one. 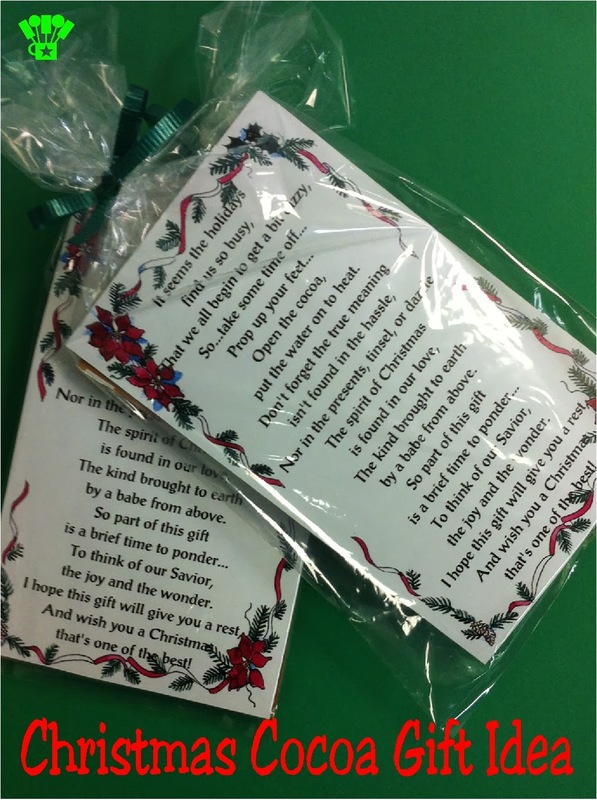 Thank you for sharing...the idea and the lovely poem. That is a great idea!! How perfect for some of my friends. Ohhh! I'm borrowing your lovely poem to pair with the homemade hot cocoa mix we're giving to my husbands co-workers. Thanks for providing it! That is such a "sweet" gift. Thanks for joining our Twirl and Take a Bow Party! Hope to see you again next week! Those are so nice! And that is a really great idea keeping some with you. Thanks for sharing and would love if you came by and linked up to What'd You Do This Weekend. Pinned!